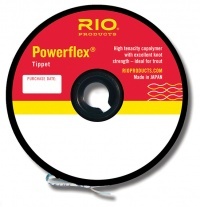 Rio’s Powerflex Tippet material is a high tenacity copolymer with excellent knot strength – ideal for trout. Rio Powerflex Tippet features superb knot strength, stretch and suppleness to make this the finest nylon tippet for any fly fishing setup. Made from co-polymer PTFE coating, this tippet's light grey color enhances its camouflage ability on the water. Available from 8X to 60lb, the Powerflex tippet material is ideal for all species. RIO Powerflex Tippet Spools are constructed of a high-tenacity copolymer with excellent knot strength, abrasion resistance, stretch and suppleness. The light gray colour provides superb camouflage in any aquatic environment. Great interlocking spools and a patented spool band to reduce tangling. Each band coded with diameter and breaking strain for fast changing.